Publishing and managing an R web service that is backed by the R code block or script you provided. Each feature can be used independently, but the greatest value is achieved when you use both. This article explains the authentication functions, the arguments they accept, and how to switch between remote and local sessions. This section describes how to authenticate to Machine Learning Server on-premises or in the cloud using the functions in mrsdeploy. In Machine Learning Server, every API call between the Web server and client must be authenticated. The mrsdeploy functions, which place API calls on your behalf, are no different. Authentication of user identity is handled via Active Directory. Machine Learning Server never stores or manages usernames and passwords. By default, all mrsdeploy operations are available to authenticated users. Destructive tasks, such as deleting a web service from a remote execution command line, are available only to the user who initially created the service. However, your administrator can also assign role-based authorization to further control the permissions around web services. mrsdeploy provides two functions for authentication against Machine Learning Server: remoteLogin() and remoteLoginAAD(). These functions support not just authentication, but creation of a remote R session on the Machine Learning Server. By default, the remoteLogin() and remoteLoginAAD() functions log you in, create a remote R session on the Machine Learning Server instance, and open a remote command prompt. The function you use depends on the type of authentication and deployment in your organization. For example, here is an AD authentication that creates a remote R session, but prompts for a username and password. That username can be the Active DIrectory/LDAP username and password, or the local admin account and its password. In another example, we authenticate using the local 'admin' account and password and create a remote R session. Then, upon login, we are placed at the remote session's command prompt. A report of the differences between local and remote environments is returned. Unless you specify otherwise using the arguments below, this function not only logs you in, but also creates a remote R session the server instance and put you on the remote command line. If you don't want to be in a remote session, either set session = FALSE or switch back to the local session after login and logout. endpoint The Machine Learning Server HTTP/HTTPS endpoint, including the port number. You can find this on the first screen when you launch the administration utility. session If TRUE, create a remote session. If omitted, creates a remote session. diff If TRUE, creates a 'diff' report showing differences between the local and remote sessions. Parameter is only valid if session parameter is TRUE. commandline If TRUE, creates a "REMOTE' command line in the R console. Parameter is only valid if session parameter is TRUE. If omitted, it is the same as = TRUE. prompt The command prompt to be used for the remote session. By default, REMOTE> is used. username If NULL, user is prompted to enter your AD or local Machine Learning Server username. password If NULL, user is prompted to enter password. If you do not specify a username and password as arguments to the login function, you are prompted for your AD or local Machine Learning Server username and password when you run this command. To authenticate with Azure Active Directory, use the remoteLoginAAD function. If you do not want to be in a remote session, either set session = FALSE or switch back to the local session after login and logout. For example, here is another AAD authentication that does not create a remote R session. It also prompts for a username and password at runtime. If you do not specify the username and password as arguments to the login function, you are prompted for your AAD username and password at runtime. Whenever you omit the username or password, you are prompted for your credentials at runtime. If you have issues with the AAD login pop-up, you may need to include the username and password as command arguments directly. authuri The URI of the authentication service for Azure Active Directory. tenantid The tenant ID of the Azure Active Directory account being used to authenticate is the domain of AAD account. clientid The numeric CLIENT ID of the AAD "native" application for the Azure Active Directory account. resource The numeric CLIENT ID from the AAD "Web" application for the Azure Active Directory account, also known by the Audience in the configuration file. commandline If TRUE, creates a "REMOTE' command line in the R console. Parameter is only valid if session parameter is TRUE. prompt The command prompt to be used for the remote session. By default, REMOTE> is used. If omitted, it is the same as = TRUE. username If NULL, user is prompted to enter username <username>@<AAD-account-domain>. If you have issues with the AAD login pop-up, try including the username and password as command arguments directly. If you do not know your tenantid, clientid, or other details, contact your administrator. Or, if you have access to the Azure portal for the relevant Azure subscription, you can find these authentication details. Indicate whether you'd like to open a local or remote command prompt upon login. Take special note of the arguments session and commandline as these influence the state of your command line. session If TRUE, create a remote session in the server. If omitted, it still creates a remote session. If FALSE, does not create any remote R sessions. commandline If TRUE, creates a REMOTE command line in the R console so you can interact with the remote R session. After the authenticated connection is made, the user is executing R commands remotely until they switch back to the local command line or logout. Parameter is only valid if session parameter is TRUE. For more information on remote execution, see this article. In the case where you are working with a remote R session, there are several approaches to session management when publishing. After you authenticate with Active Directory or Azure Active Directory, an access token is returned. This access token is then passed in the request header of every subsequent mrsdeploy request. Keep in mind that each API call and every mrsdeploy function requires authentication with Machine Learning Server. If the user does not provide a valid login, an Unauthorized HTTP 401 status code is returned. Depending on how you configure the session and commandline login parameters are subtle, your execution context can switch between local and remote contexts. In this state, we authenticate using one of the two aforementioned login functions with the default argument session = TRUE to create a remote R session, and the default argument commandline = TRUE to transition to the remote R command line. Unless you specify session = FALSE, this function not only logs you in, but also creates a remote R session on the Machine Learning Server instance. And, unless you specify commandline = FALSE, you are on the remote command line upon login. If you don't want to be in a remote session, either set session = FALSE or switch back to the local session after login and logout. In this example, we define an interactive authentication workflow that spans both our local and remote environments. You can only manage web services from your local session. Attempting to use the service APIs during a remote interaction results in an error. In this state, you can authenticate using remoteLogin, which is one of the two aforementioned login functions with the argument session = TRUE to create a remote R session, and the argument commandline = FALSE to remain in your local R environment and command line. In this example, we define an interactive authentication workflow that spans both our local and remote environments (just like state 1), but starts out in the local R session, and only then moves to the remote R session. In this state, you can authenticate with remoteLogin() and its argument session = FALSE so that no remote R session is started. 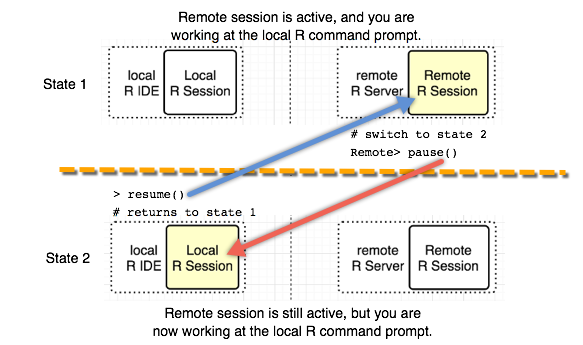 Without a remote R session, you only have the local R environment and command line. In this example, we define an interactive authentication workflow without a remote R session (session = FALSE). This is useful when working only with the web service functionality of the mrsdeploy package. After authentication, we remain confined within the local R session in order to publish and consume a service. After you log in to the remote Machine Learning Server with the argument session = TRUE, a remote R session is created. You can switch between the remote R session and the local R session directly from the command line. The remote command line allows you to directly interact with a Machine Learning Server 9.x instance on another machine. When the REMOTE> command line is displayed in the R console, any R commands entered are executed on the remote R session. Switching between the local command line and the remote command line is done using these functions: pause() and resume(). To switch back to the local R session, type 'pause()'. If you have switched to the local R session, you can go back to the remote R session by typing 'resume()'. To terminate the remote R session, type 'exit' at the REMOTE> prompt. Also, to terminate the remote session from the local R session, type 'remoteLogout()'. pause() When executed from the remote R session, returns the user to the local '>' command prompt. resume() When executed from the local R session, returns the user to the 'REMOTE>' command prompt, and sets a remote execution context. exit Logs you out of the session. To terminate the remote R session while you are on the remote command line, type 'exit' at the REMOTE> prompt. To terminate the remote session from the local R session, type 'remoteLogout()'.